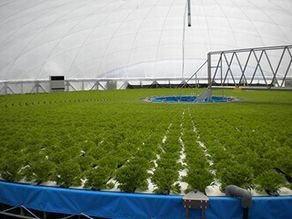 Lettuce grown through hydroponic culture is a safe and high-quality vegetable since it is cultivated in a closed space under automatic control without using pesticides, and is available throughout the whole year. Hydroponically cultivated lettuce is soft and doesn't have a bitter taste compared to that cultivated in soil. The demand for this lettuce has grown in recent years as its safety and good taste have become recognized in Japanese households. This plant can efficiently produce vegetables in a small space. It is also adaptable to urban agriculture since it can be installed not only in open rural areas but also in limited spaces that are near consumer areas. People who do not have any agricultural experience can also easily learn how to operate them in only a short period of time as the environmental controls are automated. It is also expected to play a role as an employment measure for the elderly and disabled people since operations are simple and easy. 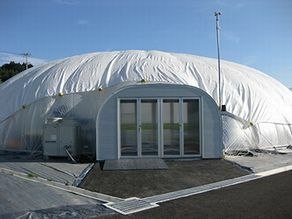 Granpa Co., Ltd. and its affiliated company Granpa Farm Ltd. (CEO Masanori Abe) constructed dome-type plant factories in Rikuzentakata City which the Great East Japan Earthquake heavily affected, receiving a "Subsidy for Revitalization of Regional Economy and Industry" (Research Projects for Practical Applications through Advanced Agriculture-Commerce-Industry Collaboration), and promoted employment of the local people. The plant factories continue to be in operation today. Copyright(C) Ministry of Economy, Trade and Industry. All rights reserved.